Headed out the desert for eight days over thanksgiving week. I borrowed a trailer and pulled the Elefant along with the GTI. Worked great. Went down to Utah to explore some canyons in the hinterlands between Monticello and Blanding, Utah. Most of the canyons I wanted to check out required 10-30 miles of 4x4 roads to reach the access points. That’s why I trailered out the Elefant. First, I followed the Colorado River down into Utah. And set up my camp for the next week. 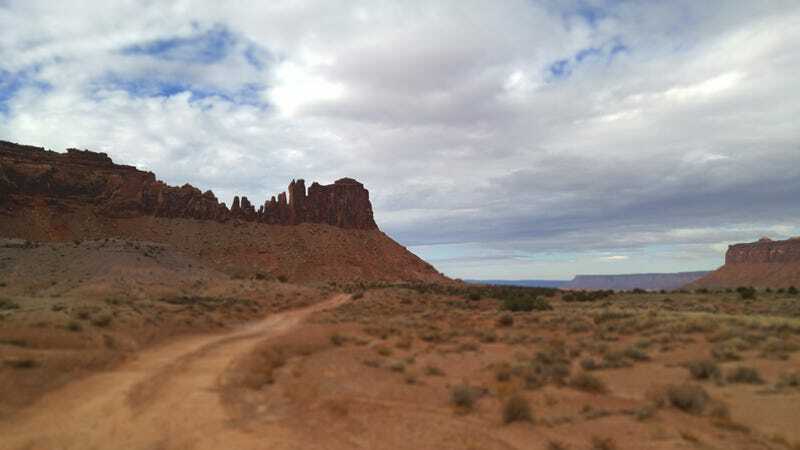 I was probably 50-60 miles south east of Moab, Utah as the crow flies..
First day there I just wanted to locate the access for a canyon about 20 miles away. So took off on the bike racing a storm system. After some exploring, I found an old road leading to the top of mesa overlooking the canyon. Amazing zone. Got some rainbow action while on the mesa rim. Even the bike got some rainbow love! Soon thereafter, I found my access point to drop into the first canyon. I still had a hour of daylight so I thought I’d go check out the trail leading into the canyon. The wet clay was slick as snot and my front and rear of the bike would constantly fish tail without warning. The tires got caked with so much mud they resembled big frosted doughnuts... Doughnuts so over-iced they had trouble fitting through the front forks.. and the entire rear swingarm was just a blob of mud; with the chain digging its own tunnel deep under the muck. On the way back to camp, I decided to check another zone following a road that wrapped around this mesa. Racing the sunset back to camp..
Random little arch within the rim rock. Just craziness....no matter where you looked.. Even the lichen was cool. Escaping back to the rim. The next few days I spent checking out some other out-of-the-way canyons. The first required driving up a river bed for 15 miles! It alternated between hardpack sand with “tidal pools” from springs. They were great! Wonderful traction on a terra firma with puddles to hit at high speeds. Fun stuff. When you followed the ledge into the grotto, I knew what I was going to find... Hey! What’s that hiding under that wall?? And totally crappy views from the pad. Imagine living here your whole life.. Tending small plots of corn and beans augmented with deer and rabbit..... Must of been horrible. Alright, back into the river wash!